A country's organ donation rate, or donors per million population (pmp) is the metric most frequently used to measure and compare the success of organ donation for transplantation systems around the world. However, there are other factors that impact on the number of transplants that a country performs. One of the most important of these is the number of organs retrieved from each donor. The higher the number of organs retrieved per donor, the higher the number of transplants that can be performed. A country with a lower organ donation rate but with a higher per donor organ retrieval rate, may actually perform a higher number of transplants than a country with a higher donation rate but with a lower per donor organ retrieval rate. 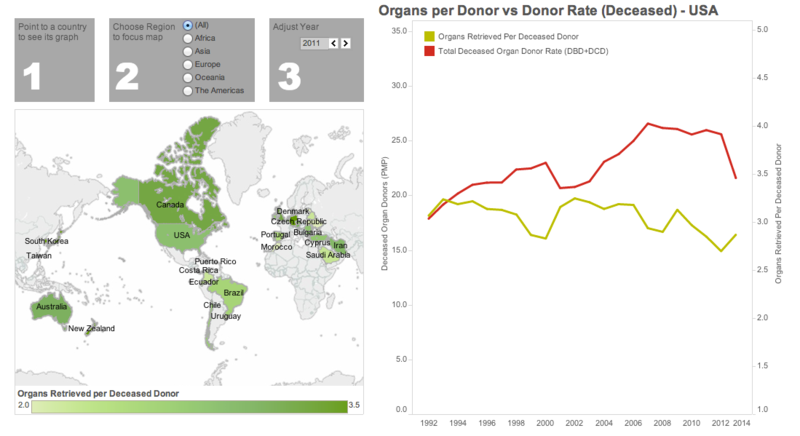 The visualization below is designed to demonstrate how the number of transplants performed per donor varies across the countries in our data set. You can explore these differences by positioning your cursor over each country and selecting different years to see how these numbers change by country and over time.